apartment pieces // Homepolish holidays (II) — color. me. quirky. If you saw this post from last week, you know that I totally nerded out when a piece of my apartment was posted on the Homepolish Instagram. And if you didn't see that post, or the Homepolish instagram, then LOOK! A piece of my apartment was on the Homepolish instagram! :) Although the holidays are over, and you might be taking down those festive decorations, I still wanted to share the pictures that didn't make the instagram cut. 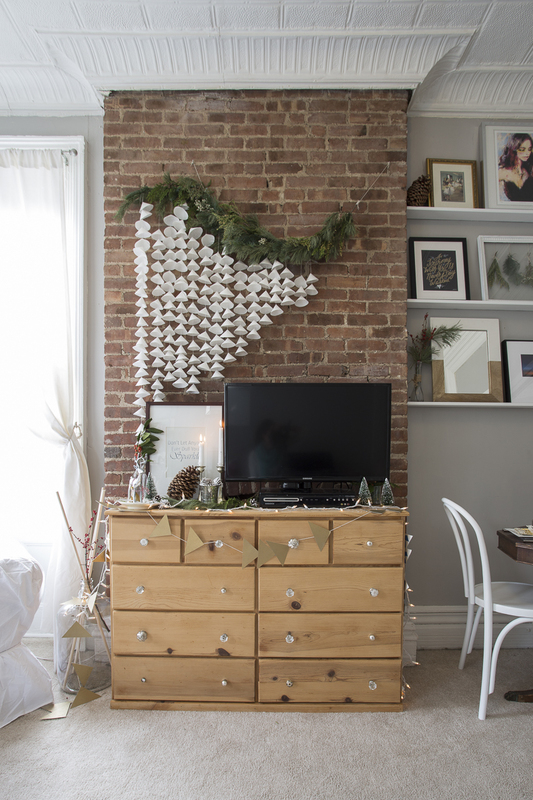 The project was simple, Homepolish wanted to share some ideas of how you can style your home for the holidays. Little touches to make the space more festive and bright. If you know me, then you know I'm a sucker for a theme, and the holidays are pretty much my favorite theme. I decided to focus mainly on my fire place wall (the fire place is sealed in the worst way possible, which is why I chose to hide it with a restored dresser) and a dining set up. I also chose to stick with a more rustic theme- mixing in a lot of natural elements with touches of red and gold. All of the pictures (besides my personal gram) were taken by Emily Sidoti , one of the amazing photographers on the Homepolish team. It was so fun getting to work with her and see a space that I styled from all different angles. Literally. Besides me snapping a few pictures, none of my spaces have ever been photographed. This was such a fun experience and I can't wait to share more. Enjoy!